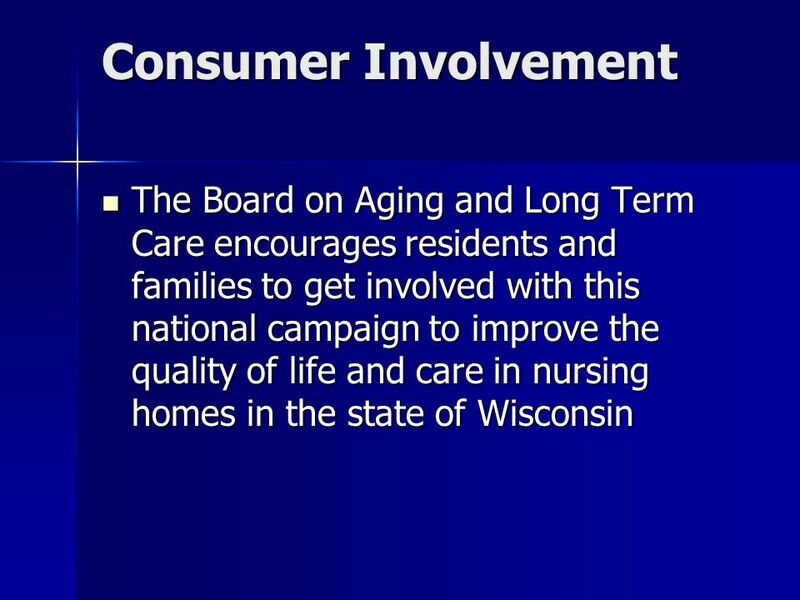 Presented by: John Sauer, WAHSA Brian Purtell, WHCA Jenifer Harrison, MetaStar Heather Bruemmer, Board on Aging and Long Term Care. 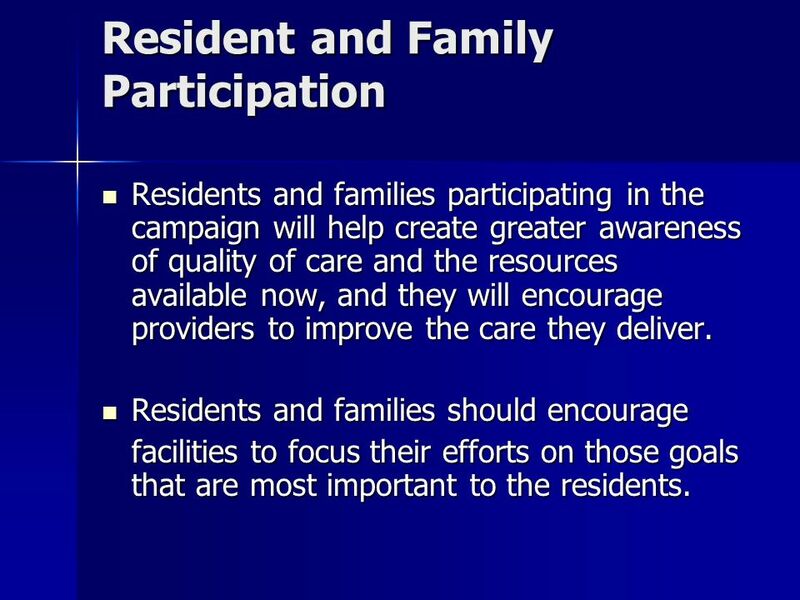 18 Resident and Family Participation Residents and families participating in the campaign will help create greater awareness of quality of care and the resources available now, and they will encourage providers to improve the care they deliver. 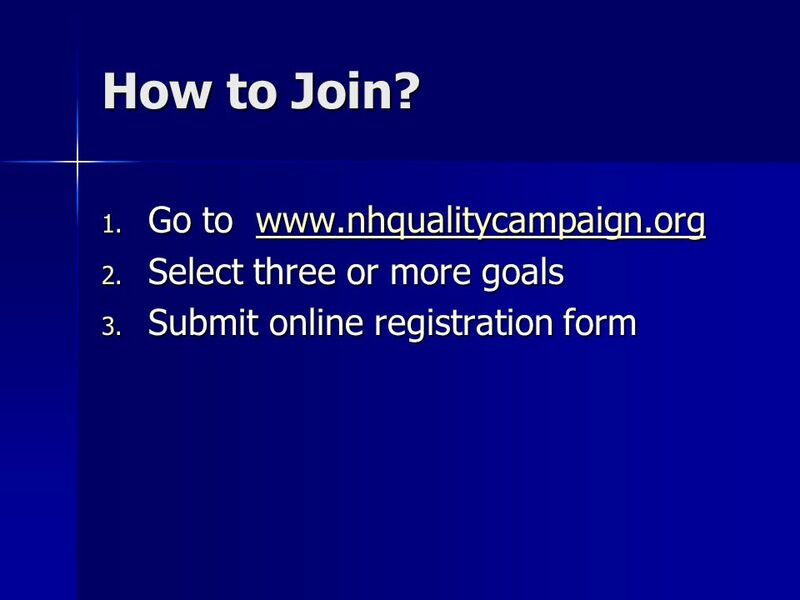 Residents and families participating in the campaign will help create greater awareness of quality of care and the resources available now, and they will encourage providers to improve the care they deliver. 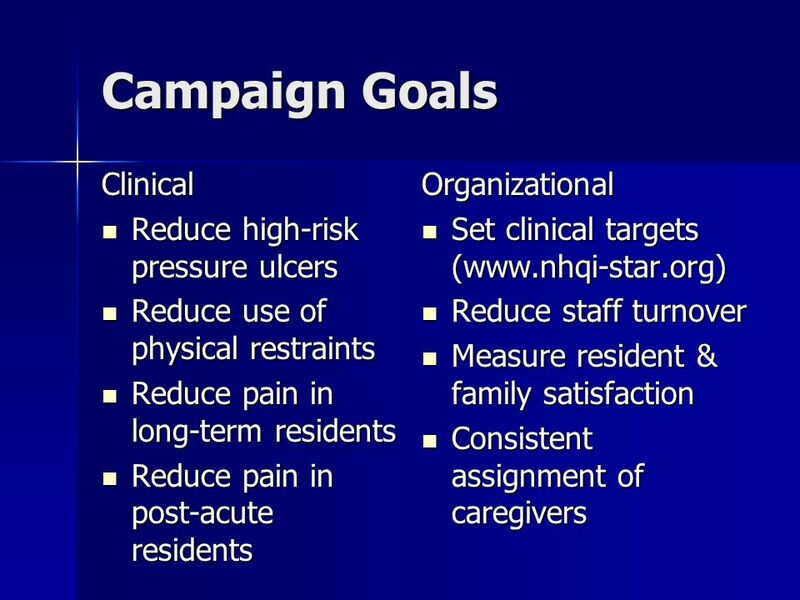 Residents and families should encourage Residents and families should encourage facilities to focus their efforts on those goals that are most important to the residents. 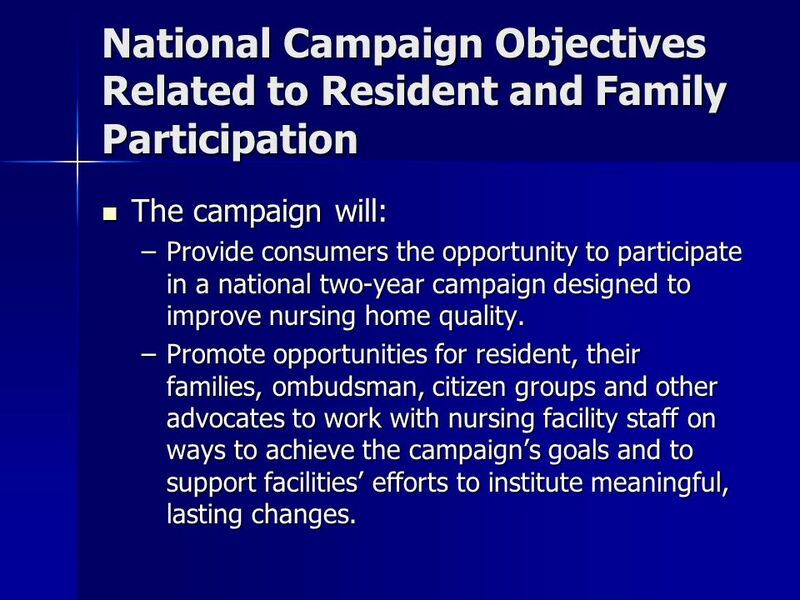 20 National Campaign Objectives Related to Resident and Family Participation The campaign will: The campaign will: –Provide consumers the opportunity to participate in a national two-year campaign designed to improve nursing home quality. 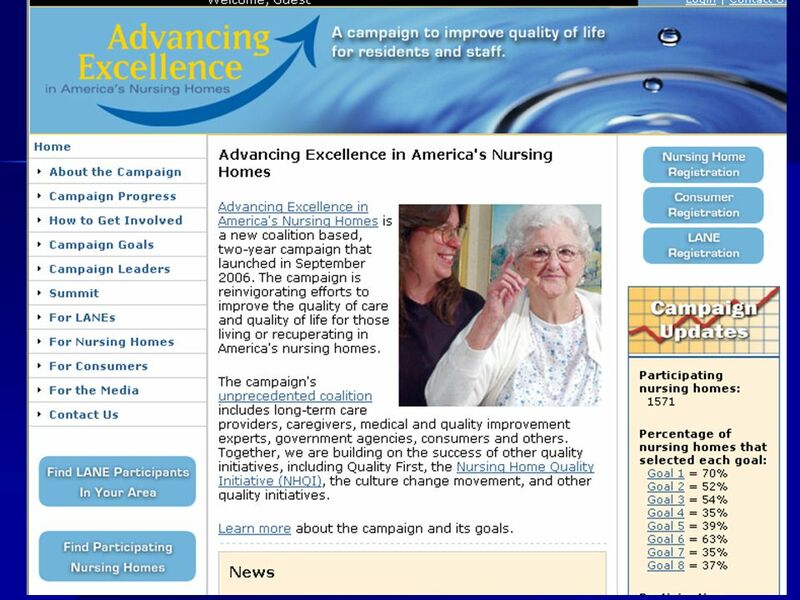 –Promote opportunities for resident, their families, ombudsman, citizen groups and other advocates to work with nursing facility staff on ways to achieve the campaigns goals and to support facilities efforts to institute meaningful, lasting changes. 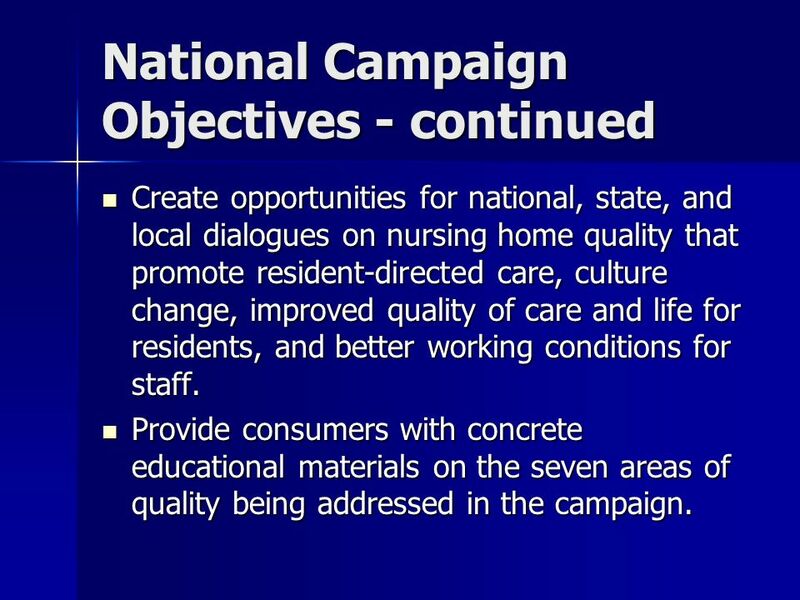 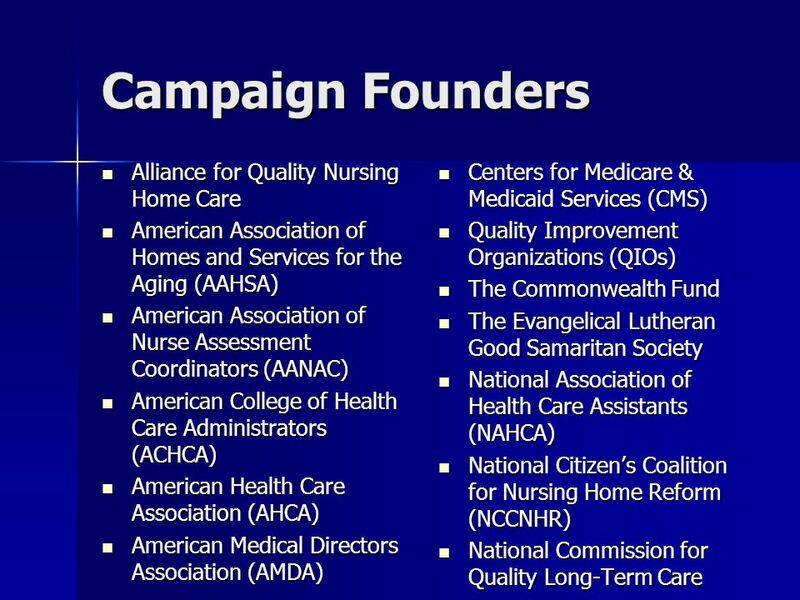 21 National Campaign Objectives - continued Create opportunities for national, state, and local dialogues on nursing home quality that promote resident-directed care, culture change, improved quality of care and life for residents, and better working conditions for staff. 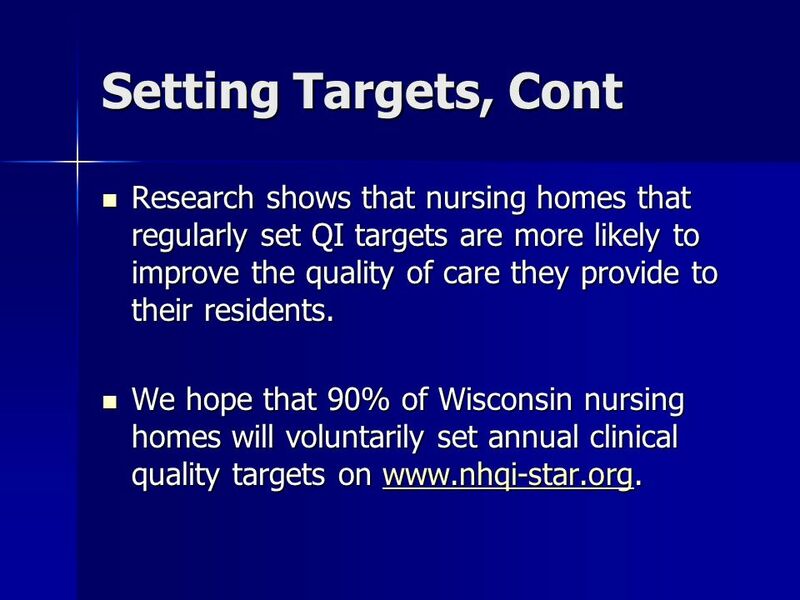 Create opportunities for national, state, and local dialogues on nursing home quality that promote resident-directed care, culture change, improved quality of care and life for residents, and better working conditions for staff. 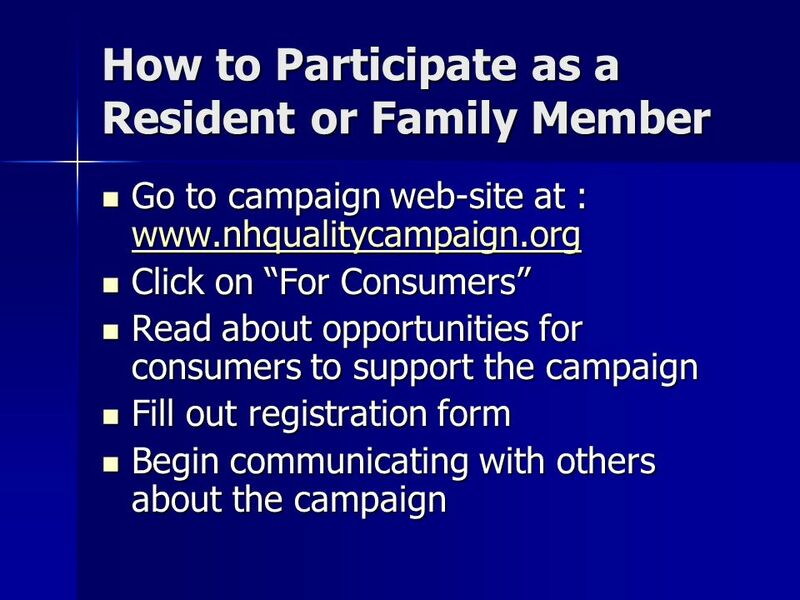 Provide consumers with concrete educational materials on the seven areas of quality being addressed in the campaign. 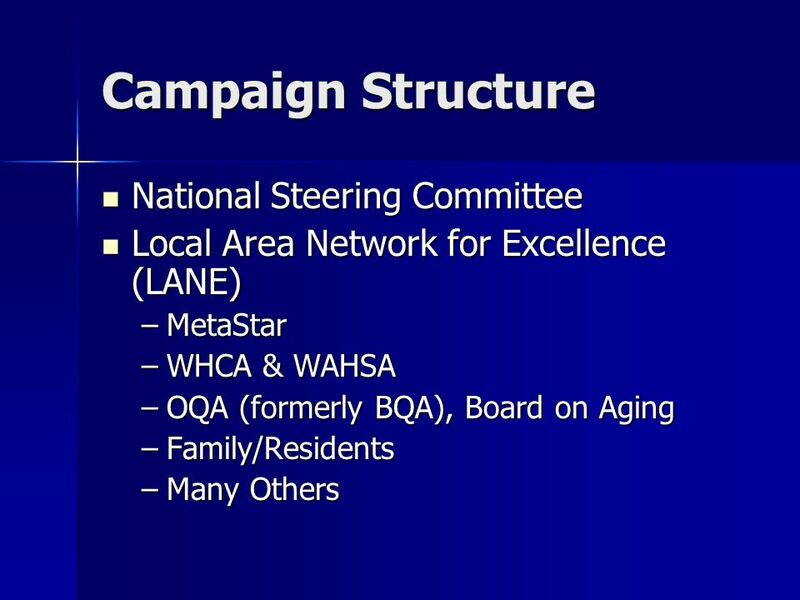 Provide consumers with concrete educational materials on the seven areas of quality being addressed in the campaign. 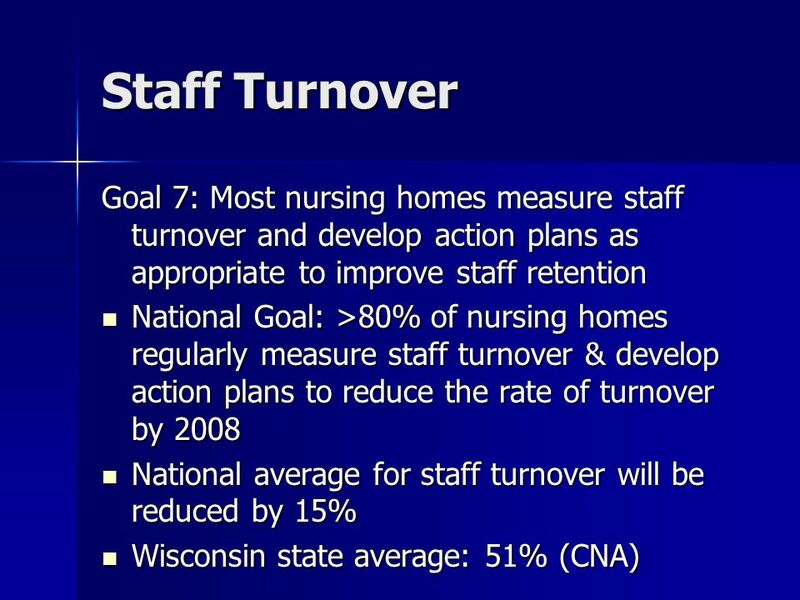 22 Why Should Wisconsin Nursing Homes Participate? 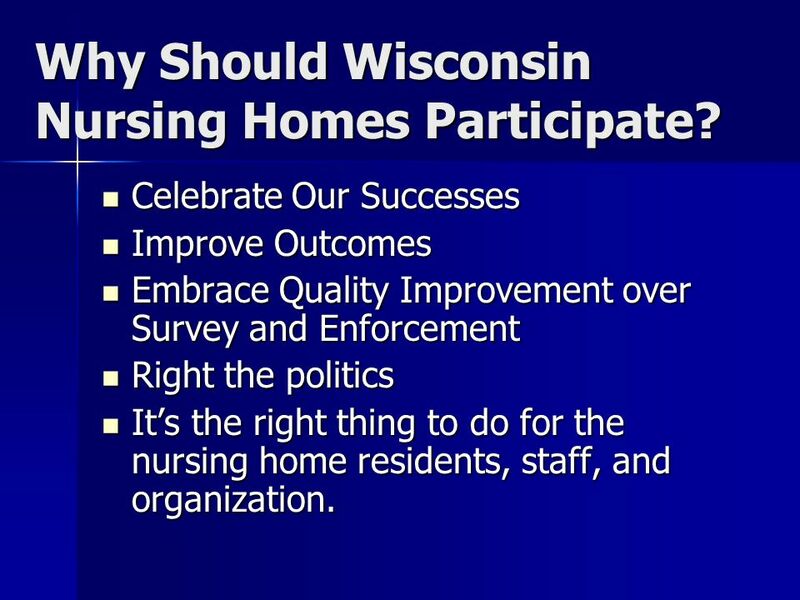 Celebrate Our Successes Celebrate Our Successes Improve Outcomes Improve Outcomes Embrace Quality Improvement over Survey and Enforcement Embrace Quality Improvement over Survey and Enforcement Right the politics Right the politics Its the right thing to do for the nursing home residents, staff, and organization. 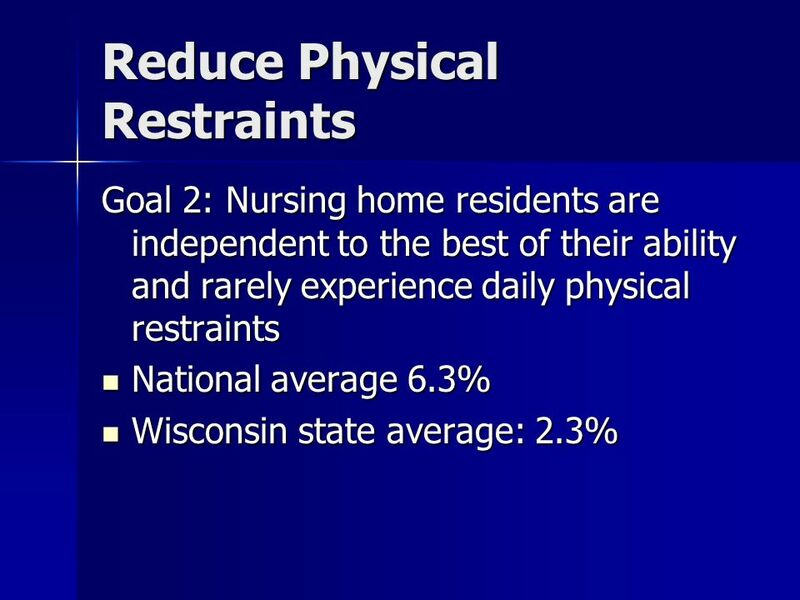 Its the right thing to do for the nursing home residents, staff, and organization. 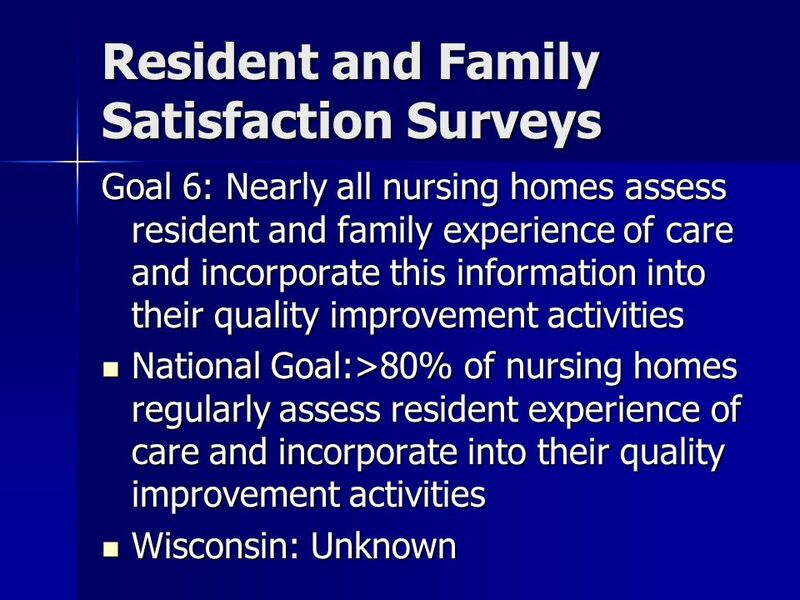 26 Questions? 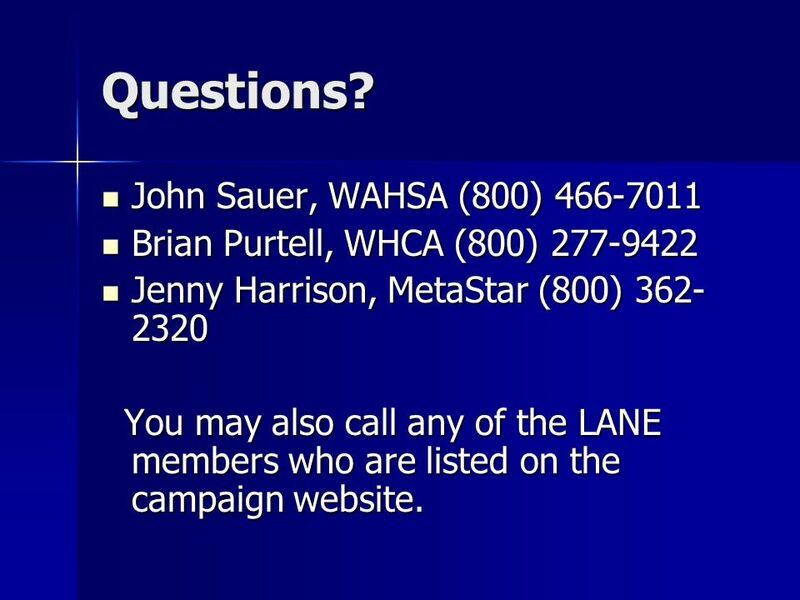 John Sauer, WAHSA (800) 466-7011 John Sauer, WAHSA (800) 466-7011 Brian Purtell, WHCA (800) 277-9422 Brian Purtell, WHCA (800) 277-9422 Jenny Harrison, MetaStar (800) 362- 2320 Jenny Harrison, MetaStar (800) 362- 2320 You may also call any of the LANE members who are listed on the campaign website. 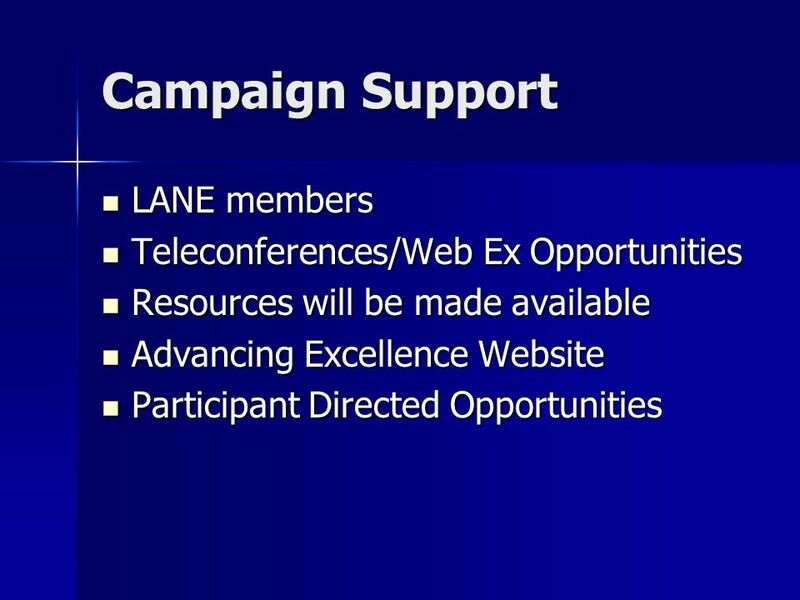 You may also call any of the LANE members who are listed on the campaign website. 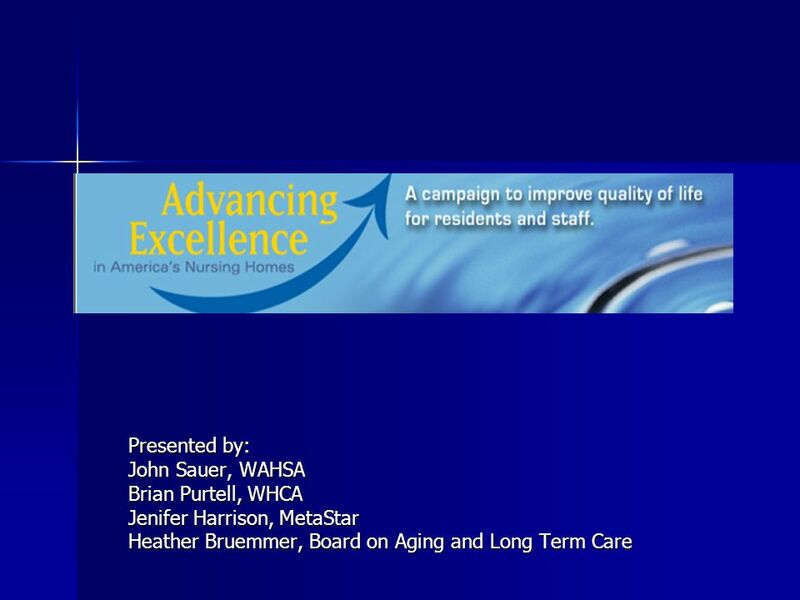 Download ppt "Presented by: John Sauer, WAHSA Brian Purtell, WHCA Jenifer Harrison, MetaStar Heather Bruemmer, Board on Aging and Long Term Care." 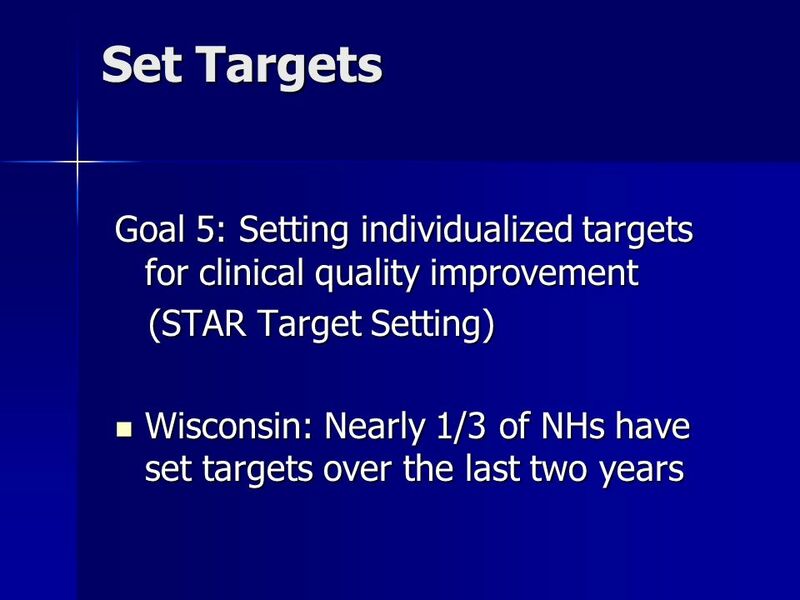 Electronic Medical Records (EMRs) in a long-term and mental-health care setting Douglas A. Struyk, President and CEO Jennifer DAngelo, Director of Software. 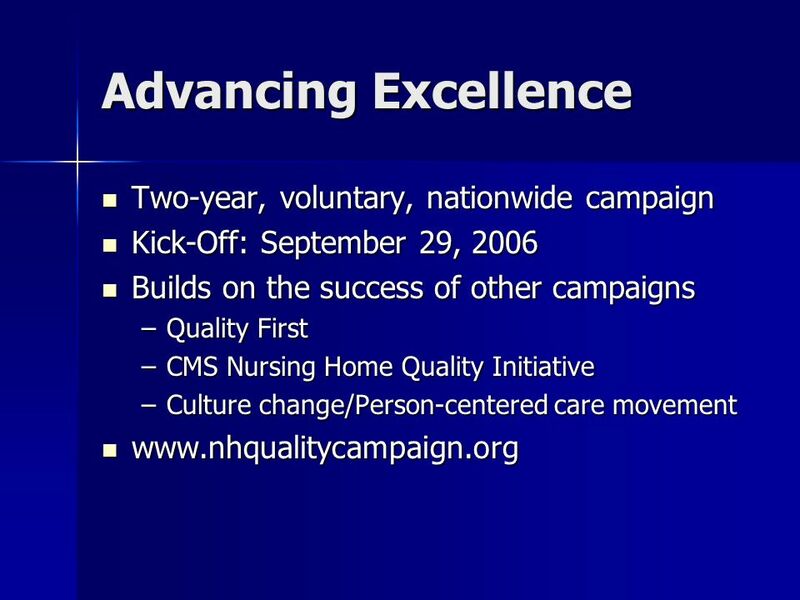 New Yorks Statewide Pressure Ulcer Improvement Initiative CMS Region 2 Third Annual Stakeholders Conference September 28, 2010. 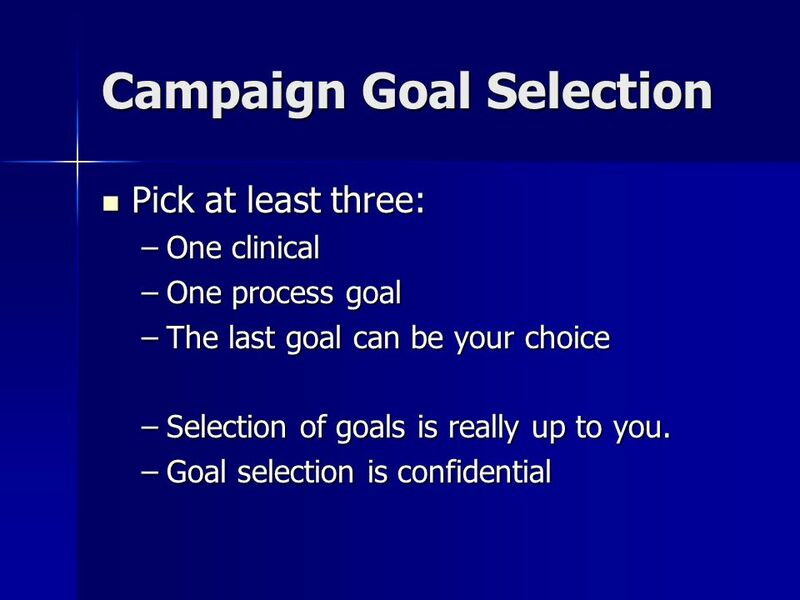 Greater than the sum of its parts: Challenges and growth of alliances in the Land of Oz MLC-3 kick off meeting August 2008 Gianfranco Pezzino, M.D., M.P.H. 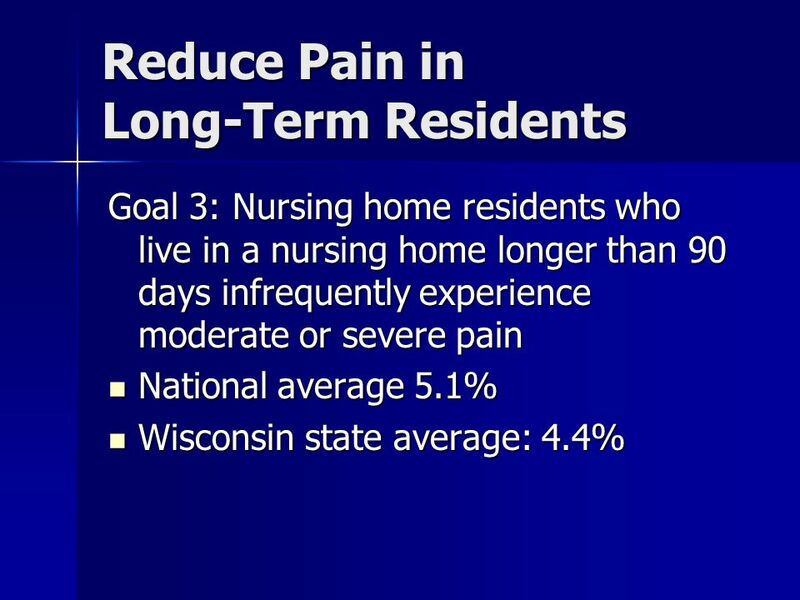 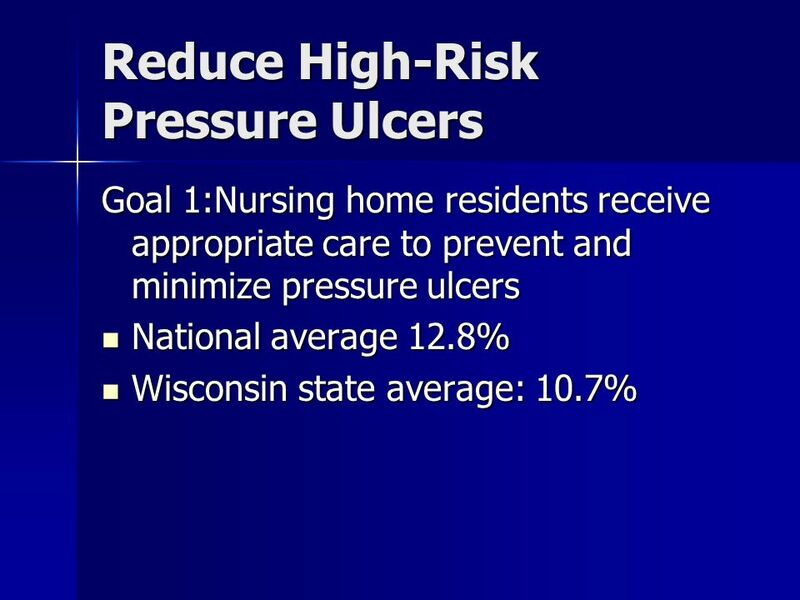 Advancing Excellence in America’s Nursing Homes A Review of 2 Clinical Tools: Pressure Ulcer and Restraints. 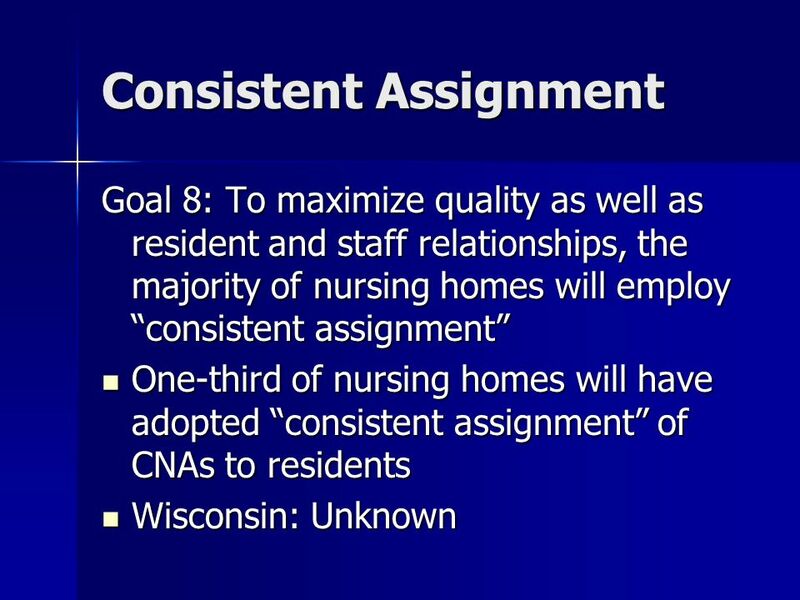 Joint Provider Surveyor Training – Spring 2012 Person Centered Care through Consistent Assignment: The Key to Quality Audrey Stob and Cean Eppelheimer. 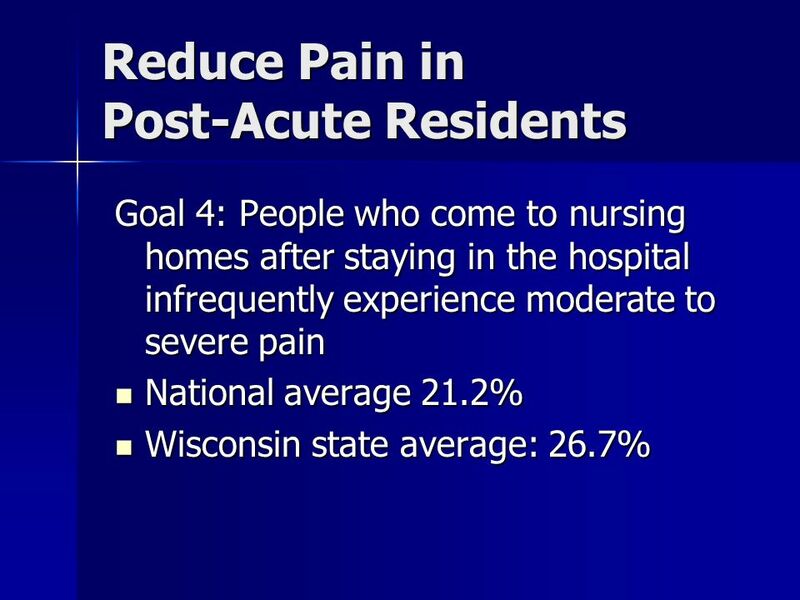 The Role of Hospice and Palliative Care in Reducing Readmissions Jennifer Wieckowski, MS, Health Services Advisory Group April Bolles, Palliative Care. 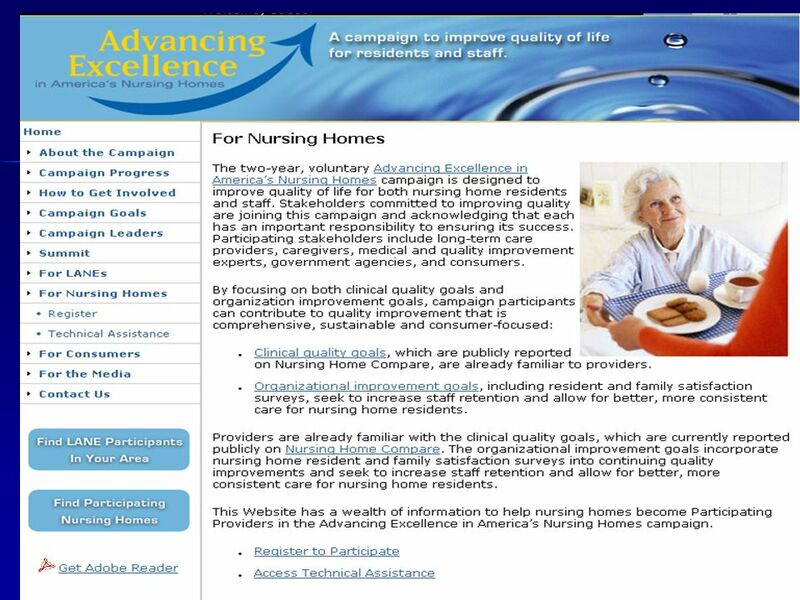 Advancing Excellence in America’s Nursing Homes Making Nursing Homes Better Places to Live, Work and Visit!